Time for a good old fashioned pub quiz! 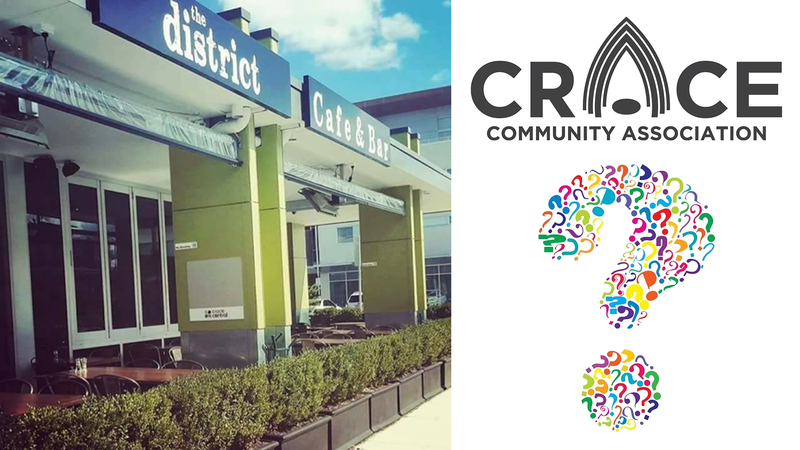 The Crace Community Association and The District invite you to join us for dinner, drinks at happy hour prices, and trivia. Each ticket not only gets you entry into the event (and the chance to win some great prizes), but also includes a meal from a set menu of pub favourites including a schnitzel, pizza and fish and chips. Vegetarian and gluten free options will be available via the pizza choices. It will be a fantastic night filled with great food, great entertainment and a chance to meet a whole bunch of friendly locals as well. Tables seat 6-8 people, though feel free to book for a smaller party if you would like. If you would like to be paired with other small groups, follow up your ticket purchase with an email and let us know. Stay tuned to the CCA Facebook page and visit the CCA website for updates and future events!